The glittery, velvet-rope glamour days of Steve Rubell, Andy Warhol and Bianca Jagger are ready to rise again on Saturday, March 9th, as the Tower Foundation of Manhasset presents Studio 54! Proceeds from this annually sold-out fundraiser—to be held at Plandome Country Club at 7:30 p.m.—will once again benefit the Tower Foundation’s mission of providing grants to the Manhasset public schools that will enhance the educational experience of our students. This year’s initiative will be to sponsor additional “Future Ready” classrooms, which feature innovative enhancements such as LED lighting, flexible furniture and improved technology to allow for a deeper level of academic engagement for Manhasset’s scholars. So dig out that Halston and your best platform shoes and come join us to shake your groove thing for a great cause! Schools and an increase in its school age population. Our fundraising efforts provide grants to the Manhasset Public Schools to enrich the educational experience of the students. Please join us for our 2018 Annual Dinner Dance Fundraiser: Havana Nights for evening of elegant fun and to support our school community! 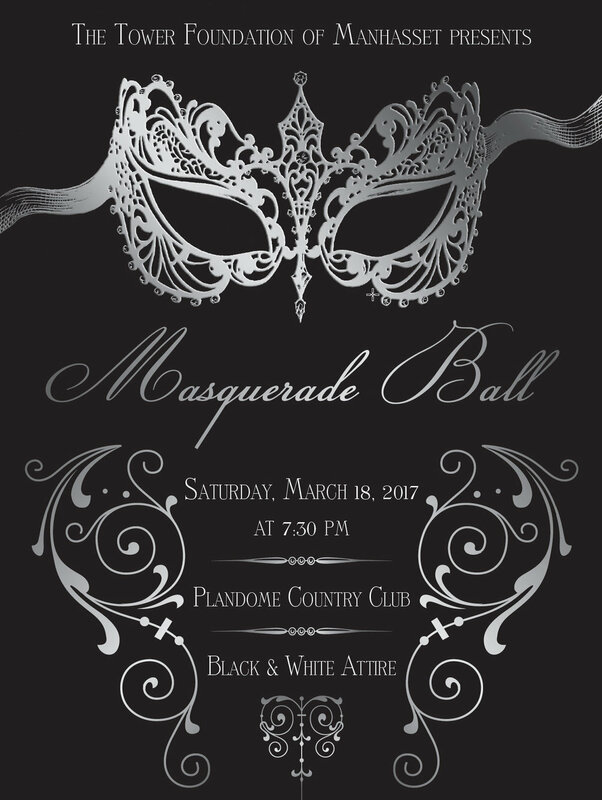 Our 2017 Dinner Dance Event will be the Masquerade Ball on Saturday, March 18th at 7:30pm at Plandome Country Club supporting our current "zSpace Initiative"! The Tower Foundation is a 501(c)(3) not-for-profit organization established in 1991 by members of the Manhasset community in response to a simultaneous decline in state funding to the Manhasset Public Schools and an increase in its school age population. Our fundraising efforts provide grants to the Manhasset Public Schools to enrich the educational experience of the students. Once again this year, we are excited to be partnering with Louis Vuitton for our Champions for Charity event at the Americana. We will be having an evening celebration on Thursday, December 1st from 6pm to 9pm. LV has some fun stuff in store for us this year, including a champagne tasting bar! Shop at ANY participating stores at Wheatley Plaza and Americana Manhasset from December 1 – December 5 and 25% of your purchases will be donated to the TOWER FOUNDATION OF MANHASSET. To register for your complimentary CHAMPION CARD or for more information, visit championsforcharity.org, call 800.818.6767, or visit the Americana Manhasset Concierge storefront location. When it’s time to make a purchase, simply present your CHAMPION CARD with any form of payment. J.Crew & Tower Foundation November Shopping Night! J Crew has once again offered to host a shopping event for the Tower Foundation. Thursday, November 12th is the actual event but you can pre-sale starting on Monday, November 9th to receive 25% off $150 or more! Just mention the Tower Foundation. Also note they will be showcasing their holiday products so bring your gift lists! Cards may be purchased at the door or payable by check made out to the Tower Foundation. The Tower Foundation of Manhasset, Inc. is a 501(c)(3) not-for-profit corporation. Your donation is tax deductible as allowed by law. The The Tower Foundation of Manhasset presents the Sequins and Bowties 2015 Gala. Join us for a fantastic fun-filled evening and help raise money to enhance our children's educational experience! Please join the Tower Foundation of Manhasset at Louis Vuitton at the Americana Manhasset for an exclusive private shopping event & cocktail party! 6pm-8pm Thursday, December 4th, 2014. A portion of the proceeds goes to the Tower Foundation to help us fund this year's initiative: Digitize the English Classroom.